Saltillo tiles is the general term for Mexican Pavers that originated in the Saltillo region of Mexico. Among the various types of Saltillo tiles is the hand made Saltillo. The hand made Saltillo can come in various sizes and shapes. The most common is the 12X12 (actually this tile is approximately 11 ½ X 11 ½). Over the 32 years Seal Systems has been sealing and refurbishing Mexican Paver tiles the hand made Saltillo has been by far the most common. The handmade Saltillo tiles usually has a square edge and a surface that can vary greatly in surface quality and absorption This variance is generally noticeable from one tile to another but more importantly there are the same variances within a single tile. Animal footprints can often be found baked into the tile. 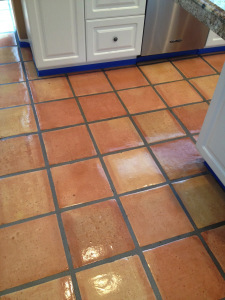 These differences are what makes it imperative that an applicator be used that will allow the sealer to be worked into and spread around the tile and grout. A uniform application of sealer to a surface that absorbs in a non-uniform manner will result in a sheen or shine that is noticeably inconsistent in light reflection. Some inconsistency will nevertheless be seen due to rougher areas that will not reflect as much light as a smoother area.